Split Liability Claims Guide – How To Make A 50/50 Fault Accident Claim? – How Much Compensation For Split Liability Personal Injury Claims? When you research personal injury claims you’ll usually read that to make a successful claim, somebody else has to be at fault. There are, however, situations where both parties can be partially to blame for the accident. This is where a split liability agreement comes into play. These agreements are used when either both parties are equally to blame for an accident or where one party is more responsible but the other does share a smaller portion of the blame. If you’d like to begin a split liability agreement claim today, you can call us on 0161 696 9685 and we’ll discuss the details of your claim right away. If you want to know more about how split liability claims work before contacting us, then please continue reading this useful guide. What Does ‘Fault’ In An Accident Mean? How Much Compensation Could I Claim When Partly At Fault? What Can I Claim When I Am Partially At Fault (50/50)? Who Will Decide The Proportion Of Liability In Split Liability Agreements? When Should I Claim From My Insurance Policy? Can I Claim For Whiplash If I Was Partially Or Wholly At Fault? How Long Do I Have To Make A Split Liability Claim? Why Claim With Our Expert Team? There are many accidents, particularly road traffic accidents, where it’s obvious who’s to be blames for the accident right from the outset. For instance, where a car collides with the rear end of another car, the one at the back would in most case be held responsible. But what about accidents that occur on a roundabout? You may believe the other driver was to blame completely and they think the same of you. In these cases, you may find that the only way to settle the argument is to let a judge in court assess the merits of both party’s claims. If however, both parties can agree on the percentage in which each were to blame for the accident such as 50/50 or 25/75 then a split liability agreement can be reached and compensation can be awarded on that basis. One recommendation around accidents, is that you shouldn’t admit liability or apologise at the scene of the accident, if you are unsure if you are to blame or not. Furthermore, gathering witness statements at the scene of any accident could remove the need for split liability agreements or improve the percentage that you’re awarded. This guide is going to explain how split liability works, how the proportion of blame is decided, what compensation can be awarded and whether you can use no win no fee agreements in split liability claims. This would mean that the claimant had no part in causing the accident, and it was entirely the fault of the defendant. This is the basis on which most personal injury claims are taken on but there are cases where both parties involved in an accident, both accept partial responsibility for the accident. Driving into the back of another vehicle is usually always the fault of the driver behind. Pulling out onto a main road, where the driver on the main road has the right of way in most cases. When a collision occurs between a car turning right to leave a highway and collides with another vehicle already on the highway and travelling in the opposite direction. Other examples of complete fault claims will exist, but this guide is going to cover the types of claims that can’t be settled in this way and the blame for the accident is split between 2 or more drivers or parties. A split liability agreement is where both parties involved in an accident have taken responsibility for the accident, sometimes this will be after a period of negotiation. Both parties can seek a percentage of compensation for any injuries or damages caused by the accident. If an accident is split 50/50 then you will receive 50 percent of the damages that would have normally been awarded if you had not been at fault at all. If both parties agreed to be equally responsible for the accident (50/50) you’d receive £5000. If it was agreed that you were 25% responsible (75/25) you’d receive £7500 compensation. This can be quite a complex agreement to make and we’d definitely recommend you make use of our free legal advice when considering making a split liability agreement. A personal injury claim involving split liability can still lead to compensation payments for your injuries, you’ll just receive a percentage of the usual award. The table below details some injuries and how much compensation can be awarded please note these amounts are if you are not at fault at all. Remember, in the case of a 50/50 split liability agreement, you’ll only receive half of the figures stated in the table. Give us a call if your injury isn’t listed and you are unsure whether or not you can proceed to make a claim. As you’ll see from the next section, the table above represents one part of the claim known as general damages. There may be other elements that can be added that may increase the amount of compensation you’ll receive. A personal injury solicitor, like the one’s provided by Advice.co.uk, can refer to a number of ‘Heads of Loss’ when compiling a compensation claim. Each case is different and so some losses may or may not be used, depending on how the accident and injuries have affected you. These are the figures that appear in the table in the previous section and are compensation payments for the pain and suffering that the injuries have caused you. They are graded from minor to severe, so your personal injury solicitor needs to demonstrate, as part of your split liability claim, the exact severity of your injuries. They may use medical professionals to demonstrate this. If you’ve incurred costs like the cost of a hire car or public transport costs because of your injuries, you could claim the cost back. While in recovery, you may need to employ specialist care to aid you. If this is the case, then the cost of the carer could be claimed back. If any item of personal property was damaged during your accident, then you would be able to claim compensation for the cost of replacing or repairing the item. When you need to take time off from work to recuperate or to have medical treatment, you may lose out on some or all of your salary depending on your employer’s sick pay policy. Any lost income can be claimed back as part of the compensation. Furthermore, if you’re likely to lose any future earnings because of your injuries, then these can be added to the claim as well. With any special damages, you should check with your personal injury solicitor, where possible, before committing to the cost to ensure that it can be justified and claimed back as part of the compensation payment. Of course, in the case of a split liability agreement, you’ll only receive a percentage of any special damages awarded as you’ll have agreed that you were partially to blame for the accident. 100% Somebody has accepted that they were completely responsible for the accident. You'll get 100% of any compensation due. 75/25 The other party has admitted the majority of the blame but you were partially to blame. You'll receive 75% of any compensation that is awarded. 50/50 Both parties are equally to blame for the accident. Your compensation will be reduced to 50% of the normal level. If you’re unsure whether it’d be a good idea to make a split liability claim, please contact one of our friendly team for advice. Deciding upon the percentage split in split liability claims can be tricky, especially if neither side wants to back down or admit any liability at all. Firstly, an insurance company could conduct their own investigations when considering road traffic accident. If the liability can’t be concluded following the investigation, then it may require the intervention of a judge in a court to decide on who was to blame and, if multiple parties were, the exact percentage split. Two cars reversing out of parking spaces at the same time and end up colliding with each other. Where one driver pulls out on to the main road from a junction and collides with another car, but the other car was driving above the speed limit for the road. Other examples exist, so if you’re unsure if you need to agree to a split liability claim, please contact us before speaking to the other party or agreeing to any percentage split. In the first example above, of the two cars reversing out at the same time, another scenario could be that one driver spotted what was about to happen and stopped their car, but the other driver didn’t, and the collision still happened. You’d think that the driver who stopped wouldn’t be liable at all, but this would be difficult to prove if there were no witnesses or any CCTV or dashcam footage to support the claim. If this is the case, it may be advisable to accept a 50/50 agreement. A split liability agreement is not to be confused with a knock for knock type agreement. 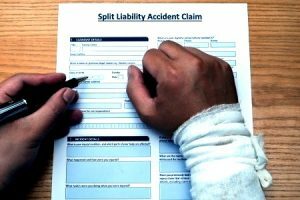 Split liability claims are used to make personal injury claims where each party has admitted to their portion of responsibility for the accident. Knock for knock means that each parties’ insurers will pay out for their clients claims themselves and nobody has admitted any liability themselves and cannot be used for personal injury claims. A personal injury claim will allow you to seek damages for injuries you’ve sustained which claiming against your own insurance won’t allow. Speak to one of our advisers if you’d like to clarify whether you should make a split liability agreement or claim on your own insurance. The only situation where you would likely claim against your insurance is if you were completely to blame for the accident. This would mean the other party involved would receive damages from your insurance, plus have their vehicle repaired and, if you have fully comprehensive insurance, your car would be repaired too. As with a non-fault accident, if you are only partially to blame for the accident, you can claim for any personal injuries, including whiplash against the other driver’s insurance policy. You’ll obviously only receive the percentage of the compensation relative to your blame, but it will be better than not receiving anything at all. If you were to blame for the accident entirely, you can’t claim for whiplash against your own car insurance policy. Depending on how the defendant (or other party involved in the accident) reacts to the claim that they were partly to blame for the accident, these types of claims may take a while to conduct. Therefore, it’s advisable to ensure you make your claim as soon as possible to allow your solicitor to deal with negotiations about liability, to allow any investigations to take place and to ensure they have enough time to gather all of the supporting evidence needed to make a claim. If you’ve decided that you want to enter in to a split liability agreement and you want to know what do next, then our recommendation is simple: pick up the phone and call us! Our team are fully trained personal injury specialists and know how to deal with split liability car accident claims in a timely manner. We’re dedicated to ensuring that you get the correct amount of compensation, especially when you’ll be losing a percentage due to the split blame. When you call, one of our professional advisers will be able to answer any questions you may have and offer free legal advice. Following that, we offer a free initial consultation where we listen to the details of your accident, understand how it happened, what injuries you sustained and how they’ve affected you. Once the consultation is over, we’ll give you our honest opinion of whether or not you have a good chance of successfully claiming compensation. If we think you do, we may be able to provide you with an estimate of how much you could entitled to. Once everyone’s happy to proceed, will put you in touch with a personal injury lawyer who works on a no win no fee basis. Some potential clients never begin a compensation claim because they’re so worried about the costs of the legal support if they lose the case. That’s why we only work with no win no fee solicitors. Pay a solicitor by the hour for their service. If they win the case, you’ll receive 100% of any compensation they win for you, but you are exposed to the risk that if they lose the case, you still have to pay them for their service. Use a solicitor who operates on a no win no fee basis. If they win the case, you pay them a success fee which is taken from your compensation (maximum 25%) for their time and service. If they lose your case, and you don’t receive any compensation, then you don’t have to pay them at all. We only work with solicitors who offer option 2 because clients tell us it’s much easier not to have to send any payment to the solicitor and because it makes an already stressful situation a little bit easier. Our friendly team of specialists are ready today to begin your claim and want to ensure you receive as much compensation as possible for any injuries you’ve sustained. We can offer free legal advice, even if you’re not sure whether to begin a claim yet and guide you on what else you could do to help or which steps you could take next. Calling us on 0161 696 9685 and speaking directly to one of the specially trained advisers. Using this simple online form to provide brief details of your claim so that we can begin the claim process. Or by sending an email to us on claims@advice.co.uk and we’ll get back to you when it is more convenient. We are personal injury specialists and can help with claims for accidents that have happened anywhere within the UK. As mentioned previously, we want to make your claim as stress-free as possible, so we’ll only provide a solicitor that works on a no win no fee basis for all cases we take on. When you begin a claim with us, we’ll put you through to one of our claims assessors who will let you ask any questions that you may have and then they’ll listen to the details of your claim including how it happened, where it happened, how you were injured and the impact the injuries have had on you. Finally, once the claim has been assessed, we’ll let you know if we believe your case is eligible to be taken on and, if so, connect you with a suitable solicitor. 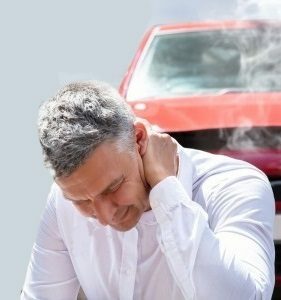 Whiplash Injuries – A guide to the cause, symptoms and treatment for whiplash and similar conditions. The Highway Code – the rules of the road in the United Kingdom for motorists, pedestrians and cyclists.